Fresh zucchini and squash are abundant in our region right now, and I was gifted some of this delicious produce this week. Tossed together with a few items I had in my kitchen already, they made an easy and hearty meal! First I washed, sliced, and quartered one large zucchini and one large squash and spread them in a glass 9x13 baking dish. I washed and cubed a couple of medium potatoes and added them to the mix. I sliced a precooked kielbasa and scattered it over the top. 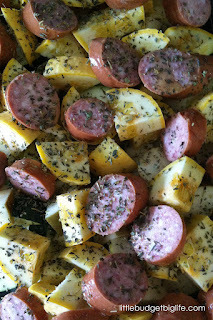 Then I drizzled the entire dish with olive oil and sprinkled with kosher salt and an Italian herb seasoning mix. I covered with foil and baked at 350 degrees for 45 minutes. Next time I will wait to add the sausage at the last 15 or 20 minutes, as it plumped up a little more than I would have preferred. But the house smelled great while it was cooking, and it tasted wonderful! We'll enjoy this simple one-dish dinner again.